Cloudeight Stationery, Free Windows Screen Savers, "Cloudeight Naturally"
This screen saver was created exclusively for Cloudeight Members and their invited guests. We hope you enjoy this beautiful Cloudeight Screen Saver and the melodies of Bill Sandy! Welcome to the "CloudEight Naturally" screen saver for Windows 95/98/NT/2000/XP. The music for this screen saver was composed exclusively for Cloudeight by Bill Sandy. Please visit Bill Sandy's online studio by clicking here. Please Click Here To Recommend Cloudeight To Your Friends! If you like our site and all we offer free, please tell a friend about us!Just click on our mascot "Cloudie" to recommend CloudEight to a friend. the quality of our free Web site by visiting our advertisers or ordering one of our great CDs. All content is copyright © 2002 by CloudEight Internet. This screen saver is copyright© 2002 by CloudEight Internet. 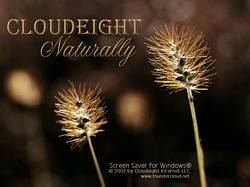 Visit Cloudeight at http://www.thundercloud.net Music composed and sequenced by Bill Sandy. Copyright © Bill Sandy. Cloudie Mascot logo is © copyright 2001-2002 by CloudEight (designed by Dennis Cox). Questions or comments?